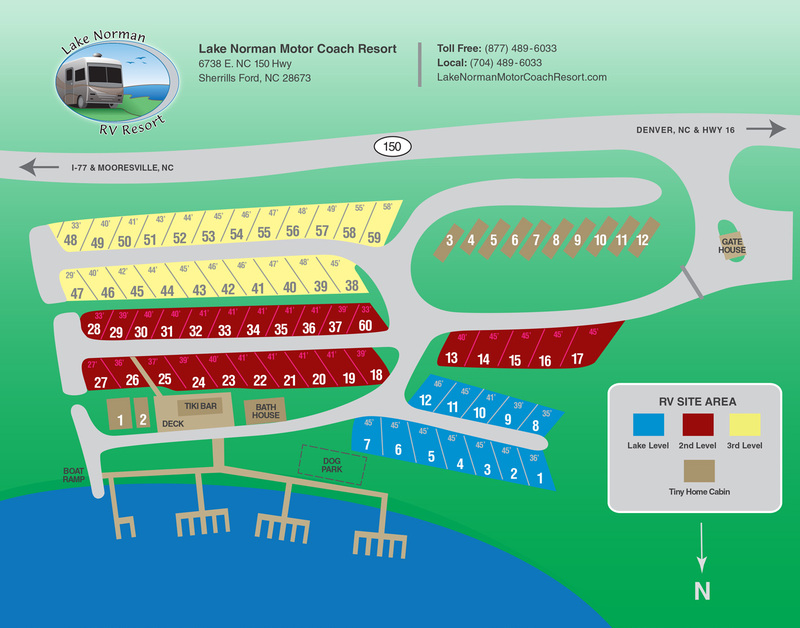 Lake Norman Motor Coach Resort is located in Sherrills Ford, North Carolina on the banks of beautiful Lake Norman. Our resort offers (11) fully furnished one and two bedroom tiny home cabin, a lakefront cabin, as well as, (60) full hookup 20/30/50 amp RV sites for commercially manufactured Class A, B, and C motorhomes, 5th wheel, and travel trailers. All of our accommodations and RV sites are made available for rent on a daily, weekly, monthly or seasonal basis. Lake Norman Motor Coach Resort offers the latest and most modern facilities set on a tranquil lake. Our lakefront cabin, our tiny home cottages, and a majority of our RV sites enjoy panoramic views of Lake Norman. Call to get up-to-date availability: (877) 489-6033 or review our tiny home reservation options. Our resort offers (11) fully furnished one and two bedroom tiny home cabins, a lakefront cabin, as well as, (60) full hookup 20/30/50 amp RV sites for commercially manufactured Class A, B, and C motorhomes, 5th wheel, and travel trailers. All of our accommodations and RV sites are made available for rent on a daily, weekly, monthly or seasonal basis. Lake Norman Motor Coach Resort guests enjoy full access to the facilities and amenities listed below. If you have questions or concerns, please contact the on-site manager at: (704) 489-6033. Our guests enjoy sparkling clean, granite and porcelain tiled bath house features private shower suites. Located in our Bath House. We have (2) quarter-operated washers and dryers and change machine on-site. Detergent is available for purchase. Stay connected during your stay at Lake Norman Motor Coach Resort! Located on the deck, open Memorial Day - Labor Day. A perfect place to socialize with guests overlooking the lake. 4500 sq. ft. of gorgeous panoramic views. Our resort is gated. All guests are provided a key code for 24/hr access to the property. Bring your boat or jet ski personal watercraft and enjoy Lake Norman from the water. Available to rent $20/day or $250/month. Full day and half day rentals available. ID required. Sorry, no pets allowed. Kayaks, paddle boards, paddle boats, canoe & fishing boat all available on a first come/first served basis to our guests. No pets allowed in our tiny home rentals. RV guests are welcome to bring their pets with the following restrictions: two pet maximum per RV site. Pets must be restrained at all times on a leash no longer than 6’. Enjoy a fenced, off-leash, dog park on site. Please pick up after your pet and utilize waste stations located throughout the resort. Unfortunately, insurance liability prevents us from allowing the following breeds on property: Doberman Pinscher, Chow Chow, Pit Bull Terrier, Rottweiler or any mix of these breeds. We apologize in advance. The resort offers access to BBQ grills at the lakefront. Grilling tools, charcoal, lighter fluid, and lighter also available upon request. Porch with rocking chairs or a deck with table, umbrella and chairs. Our resort offers a beautiful, fully furnished, second floor lakefront cabin with 800 sq. ft of living space for you to enjoy. Lake Norman Motor Coach Resort want to make your stay as relaxing and enjoyable as possible. If you have questions or concerns, please contact the on-site managers at: (704) 489-6033. Note: early check-in by request, based on availability. Call (704) 489-6033 the day of your arrival. RVers must check-in before dark as our resort is not lighted. We apologize for any inconvenience. Note: Would you like to extend your stay? Call the office at least 24hrs prior to departure. We may be able to accommodate you based on availability. Guests may receive visitors for day or overnight. All guests must register at gatehouse upon arrival. Please be courteous of others. Keep showers to 15 minutes and remove clothing from washers and dryers promptly so that other guests may use the facilities. Be sure to collect all belongings before exiting building. No pets allowed in our tiny home cabin rentals. RV guests are welcome to bring their pets with the following restrictions: two pet maximum per RV site. Pets must be restrained at all times on a leash no longer than 6’. Enjoy a fenced, off-leash, dog park on site. Please pick up after your pet and utilize waste stations located throughout the resort. Unfortunately, insurance liability prevents us from allowing the following breeds on property: Doberman Pinscher, Chow Chow, Pit Bull Terrier, Rottweiler or any mix of these breeds. We apologize in advance. Smoking is permitted at RV sites, the porches of the tiny home cabins, the lakefront cabin porch and designated spots at the Tiki bar and deck only. Smoking is prohibited inside the tiny home cottages and inside the lakefront cabin. Alcohol is restricted to the tiki bar and deck area, tiny home cottages, lakefront cabin and your RV site. Disorderly guests will be asked to leave the resort. Illegal drugs and contraband are prohibited at all times. Fireworks of any kind are prohibited. Firearms are prohibited except as permitted by law. Guests with motorcycles are welcome. Please idle in and out of the resort. Please refrain from putting items on fence, climbing on or damaging them in any manner. Keep children and pets away from fences and retaining walls. No business or commercial activity of any kind shall be allowed on any unit or from the resort in general. Parking is limited to one vehicle per RV site and two vehicles per tiny home cottage and the lakefront cabin. Additional parking is available by the gatehouse for trailers and tow trailers etc. While the gate house is lighted it is not a secure facility. The Resort accepts no responsibility for damage, loss of vehicles, boat trailers, jet skis etc left in the parking lot. Due to our topography be especially careful when using golf carts, mini-bikes or scooters. Parents are responsible for their children on bicycles, rollerblades, roller skates, skate boards etc. We are a privately owned resort and reserve the right to select our clientele and refuse anyone. We reserve the right to discharge any person(s) for failure to abide by our rules and regulations. If a camper is ejected they will forfeit all campground fees paid. We reserve the right to conduct site inspections throughout the resort at any time including access to the site for landscaping and routine maintenance.